Activists chained themselves to logging equipment in Poland's ancient Bialowieza forest on Thursday to stop authorities from felling trees in the UNESCO World Heritage site that is Europe's last primeval woodland. "We'll stay till the end, as long as it takes," said Warsaw environmentalist Piotr Dankowski, one of two young activists who chained themselves to the equipment to prevent it from leaving the car park in the eastern village of Czerlonka where it had been stationed overnight. They were backed by around a dozen activists from Greenpeace and fellow environmental group Dzika Polska (Wild Poland), who held up banners that read "Stop logging" and "Save Bialowieza Forest". A few hours into the protest, police intervened and forced activists to unblock one of the machines near the vast woodland that is home to unique plant and animal life, including some 800 European bison, the continent's largest mammal. "Despite the police's intervention, which involved the use of force, some of the activists remain on site and are continuing to protest. One of the machines remains blocked," Greenpeace Polska spokeswoman Marianna Hoszowska said in a statement. 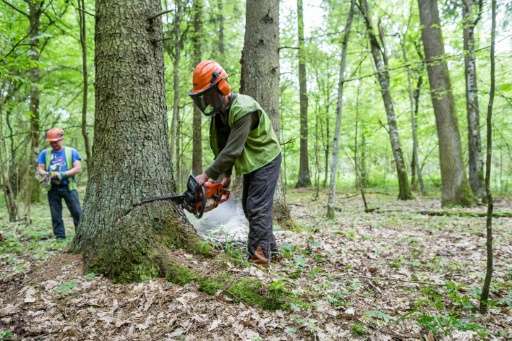 The Polish government began logging in May last year, saying it was clearing dead trees to contain damage caused by a spruce bark beetle infestation, fight the risk of forest fires and preserve road traffic. Scientists, ecologists and the European Union protested and activists now allege that it is being used as a cover for the commercial logging of protected old-growth forests. Bialowieza, which straddles the border with Belarus, includes one of the largest surviving parts of the primeval forest that covered the European plain ten thousand years ago. In late April, the EU's executive branch—the European Commission—sent Warsaw a "final warning" saying it could take legal action to halt the large-scale logging. The EU is concerned the logging will cause irreparable loss of biodiversity in the woodland that belongs to the EU's Natura 2000 network of protected areas. Greenpeace Polska said in a statement that Thursday's action was meant to "buy time to collect evidence regarding actions that go against EU rules and the UNESCO agreement."